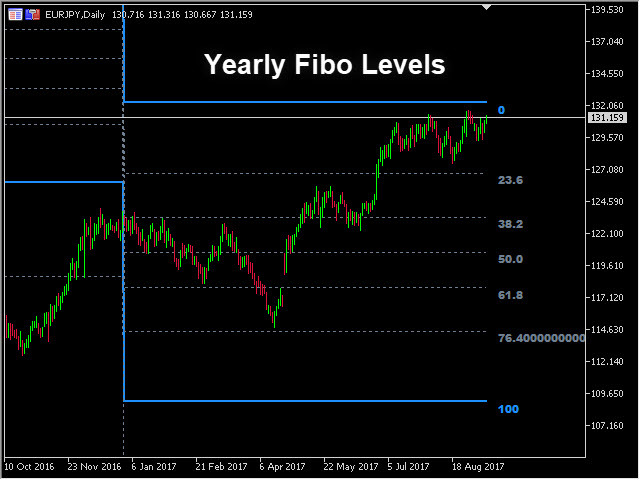 PipTick Fibo indicator allows to automatically display the Fibonacci retracement levels which represent a significant support and resistance. The range for calculation of the indicator can be taken from previous day, week, month, year or user-specified session. 100 % (High) of the range from previous session. 0 % (Low) of the range from previous session. 76,4 % of the range from previous session. 61,8 % of the range from previous session. 50 % of the range from previous session. 38,2 % of the range from previous session. 23,6 % of the range from previous session. 138,2 % of the range from previous session. It is very useful to insert multiple copies of our indicator to the chart and watch the levels from daily, weekly and monthly sessions. 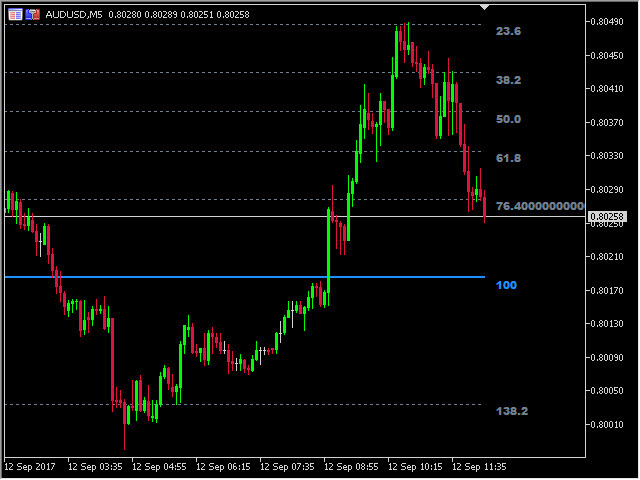 They tend to work very well as a strong support and resistance levels. 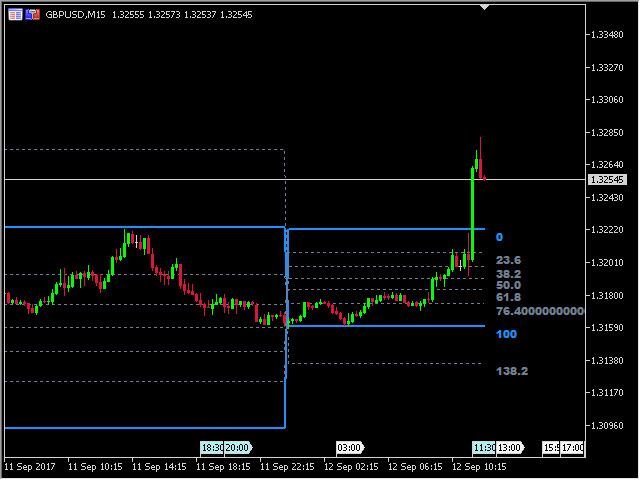 The indicator shows the Fibonacci of the range from previous session. Alert notifications for indicator lines. Works on every timeframe (M1, M5, M15, M30, H1, H4, D1, W1, MN). Customizable parameters (Colors, Line thickness, Visibility...). Available for MT4 and MT5. Session_Mode - Allows to choose between Daily, Weekly, Monthly, Yearly and Custom Session mode. 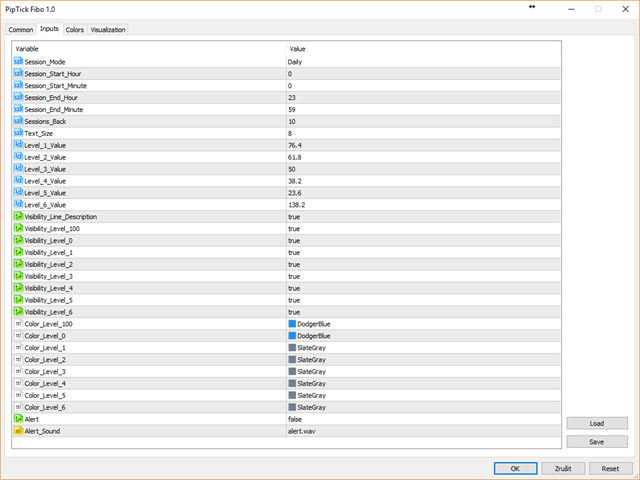 Session_Start_Hour - Allows to set start hour if the session time mode is set. In other case the parameter is ignored. Session_Start_Minute - Allows to set start minute if the session time mode is set. In other case the parameter is ignored. Session_End_Hour - Allows to set end hour if the session time mode is set. In other case the parameter is ignored. Session_End_Minute - Allows to set end minute if the session time mode is set. In other case the parameter is ignored. Sessions_Back - Allows to set the number of sessions to display. When the value is zero, all sessions are displayed. Text_Size - Text size of the indicator levels. Level_1_Value - Allows to set retracement 1 value. Level_2_Value - Allows to set retracement 2 value. Level_3_Value - Allows to set retracement 3 value. 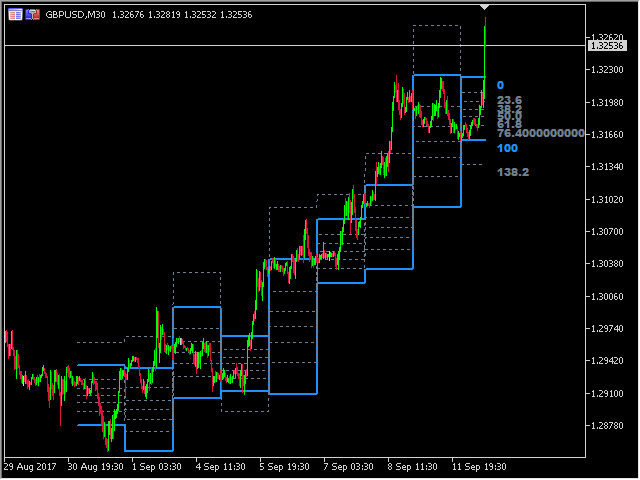 Level_4_Value - Allows to set retracement 4 value. Level_5_Value - Allows to set retracement 5 value. Level_6_Value - Allows to set retracement 6 value. Visibility_Line_Description - Allows to enable or disable displaying of description of lines. Visibility_Level_100 - Allows to enable or disable displaying of the previous session high line. Visibility_Level_0 - Allows to enable or disable displaying of the previous session low line. 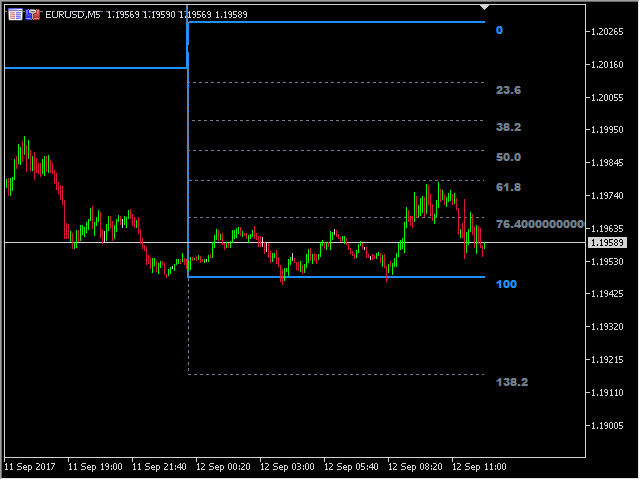 Visibility_Level_1 - Allows to enable or disable displaying of the retracement level 1 line. Visibility_Level_2 - Allows to enable or disable displaying of the retracement level 2 line. 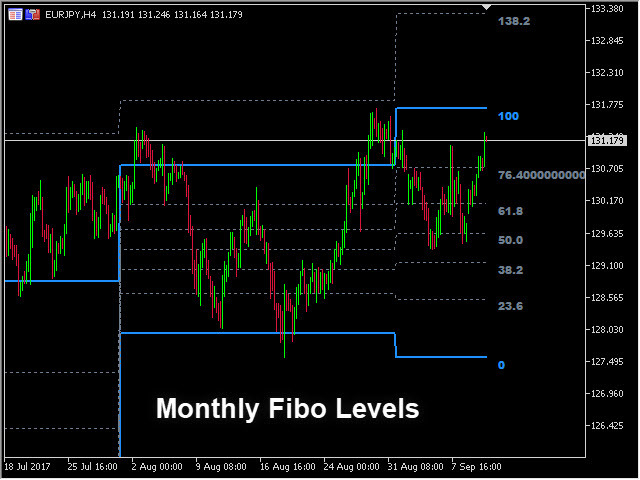 Visibility_Level_3 - Allows to enable or disable displaying of the retracement level 3 line. 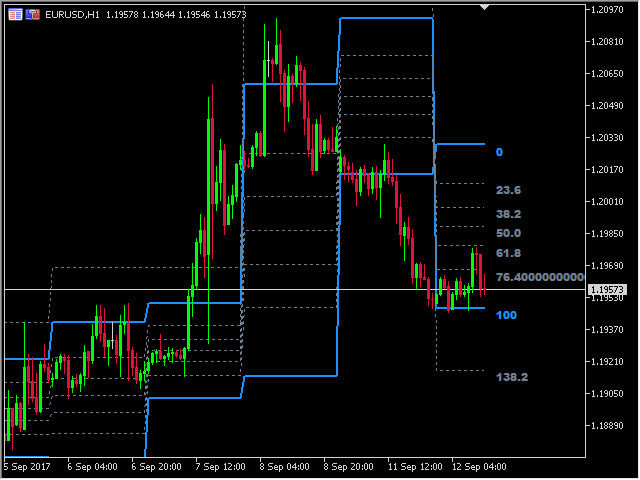 Visibility_Level_4 - Allows to enable or disable displaying of the retracement level 4 line. 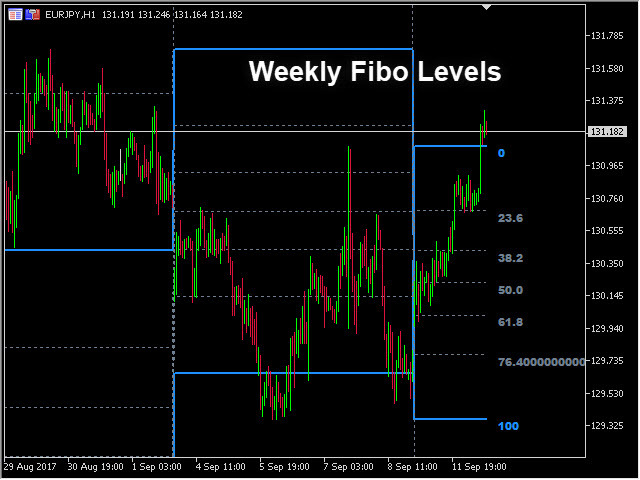 Visibility_Level_5 - Allows to enable or disable displaying of the retracement level 5 line. 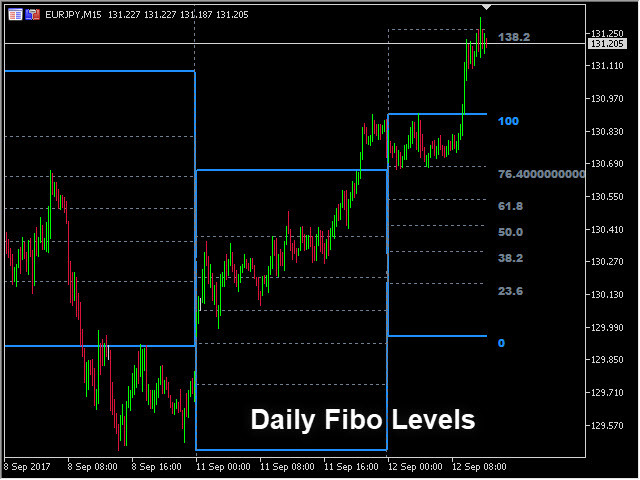 Visibility_Level_6 - Allows to enable or disable displaying of the retracement level 6 line. Color_Level_100 - Color of the previous session high line. Color_Level_0 - Color of the previous session low line. Color_Level_1 - Color of the retracement level 1 line. Color_Level_2 - Color of the retracement level 2 line. Color_Level_3 - Color of the retracement level 3 line. Color_Level_4 - Color of the retracement level 4 line. Color_Level_5 - Color of the retracement level 5 line. Color_Level_6 - Color of the retracement level 6 line. Alert - Allows to enable or disable alert notifications when the market touches one of the indicator lines. Alert_Sound - Allows to choose the alert sound. Level_100 - Value of the high of range. Level_0 - Value of the low of range. Level_1 - Value of the retracement level 1. Level_2 - Value of the retracement level 2. Level_3 - Value of the retracement level 3. Level_4 - Value of the retracement level 4. Level_5 - Value of the retracement level 5. Level_6 - Value of the retracement level 6.